Nobody loves April Fools’ more than the technology industry. But out of all the companies, Google spends the most time cranking out day-long features, elaborate product videos, and jokey press releases. We’ll be covering the best pranks in our updating roundup. Be sure to leave a comment if you come across a particularly funny one. Samsung has been aggressively expanding into the Internet of Things with their lineup of SmartThings devices. The company has just announced a similarly named Internet of Trousers fashion line that incorporates technology and clothing. 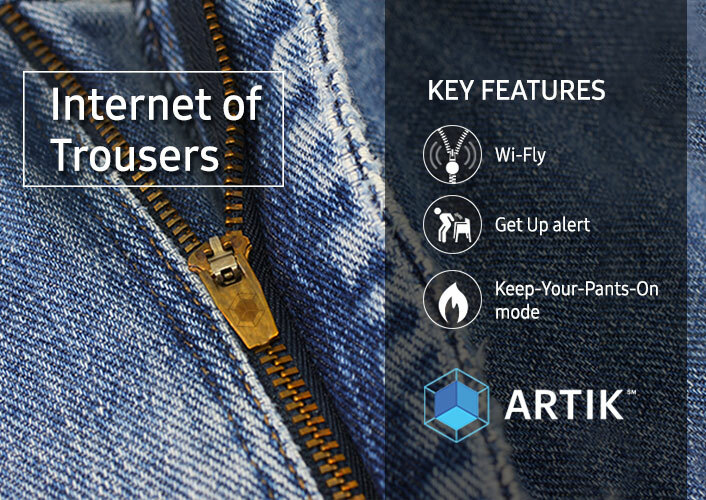 These ultimate wearables are powered by ARTIK Smarter Fashion chip module and controlled by the Smarter Fabric Care companion app. Features include push notifications when your fly is down (Wi-Fly) and an aggressive stand up alert that shocks you for being inactive. One of the highlights of proper IoT devices is the ability to connect with other gadgets, so these smart trousers will appropriately notify your Samsung fridge to remain locked if you’ve been overeating. If you want to know how much Googlers like April Fools, type ‘Take me to Funky Town’ in Google Maps on Android. 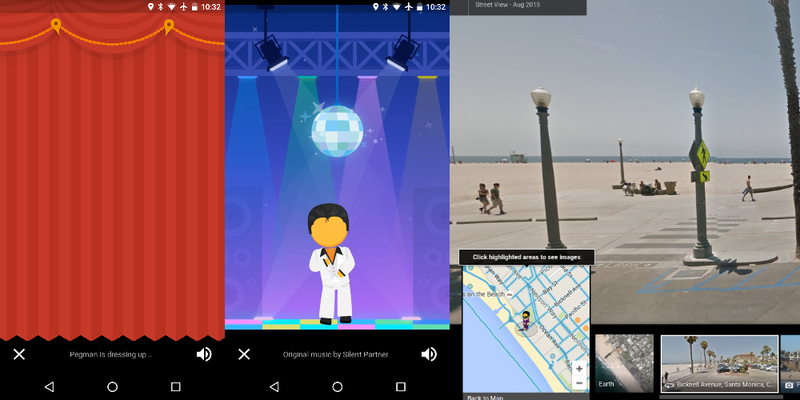 You’ll be treated to pegman dressed up in disco attire grooving to 1979’s Funkytown by Lipps Inc. On the web, you’ll notice that the pegman used to start Street View is dressed up in similar clothing. There are always a few April Fools’ jokes that actually sound pretty useful. This year’s goes to emoji Smart Reply in Inbox. The current Smart Reply feature in Inbox uses neural networks to suggest possible ways to reply to a message. On April 1, the feature will apparently only suggest emoji responses. While not appropriate for emails, this kind of Smart Reply would be quite useful in a messaging app like Hangouts or Google Messenger. Come tomorrow, you’ll see a ‘Send + Mic Drop‘ button in Gmail on the web. It’s intended for use in seemingly never-ending email threads that go back and forth and have no resolution. After getting in the last word, pressing the button will insert an appropriate GIF and archive the message. Update: Google has walked this one back. First and foremost, Google wants to dispel the notion that the AMP project to fasten the mobile web is magic. “It isn’t magic, it’s physics.” Responsible for many of their speed breakthroughs is the Very Large Mobile Page Accelerator. Such findings include how the gravitational attraction of heavy elements can lead to various and strange quantum effects. They also proved string theory, but I digress. With Google Cardboard Plastic, you can see the most immersive thing there is: actual reality. The lightweight viewer is fully immersive, waterproof, works with all apps, and offers 360 degree audio. As Google notes, “What’s realer than real? Probably nothing. Or maybe something.” But in all seriousness, this so far is the best April Fools’ joke and Google only wishes people would be willing to strap this on to their faces. There’s definitely an emoji theme to this year’s April Fools’ festivities. Google Photos has the added the ability to search for images using emoji. Every company in the delivery business is investigating using drones. However, the technology is far from ready, so Google has come up with an intermediary solution. With parachutes, Google can deliver packages, as well as joy to users. The company’s controlled hover utilization team of engineers researchers and scientists (C.H.U.T.E.R.) spent years developing the various aspects of a parachute to provide a seamless experience. I advise you to watch this video till the very end. Google always had grand ambitions for the Material Design guidelines. Now, they are expanding it to makes apps and games feel native in space. Material Zero-G will feel intuitive thanks to such elements as fixed point view and a FAB which doubles dimensions for easier tapping. The Guardian is one of the first apps to be designed natively for space. If self-driving vehicles are a reflection of American car culture, then self-driving bicycles perfectly reflect the Netherlands. For today only, you can request a bike pick you up and an added comfort mode will adjust the pedals to a perfect resting position. Additionally, it has such features as auto-balancing even when pushed and uses a 360 camera to remain aware of its surroundings. Don’t you just miss the smell of old paper and the ability to decorate your shelves with them? With realBooks, Google is stripping away all the parts of a smartphone that books don’t have. No apps, videos, or cellular connections. The end result is just a screen with one sole book. These realBooks can be purchased for $19.99 and arrive in 14 short days. In some use cases, the gigabit internet Google Fiber is rolling out is too slow. Terribly slow. An unnamed research organization is working on teleporting a 160 pound person 60 miles in 1.2 seconds. Using a compression algorithm (with only imperceptible levels of quality degradation) it would require a connection that is 1 billion times faster than gigabit internet. Google has created a spreadsheet to enter your own weight and figure out how far you’ll be able to go and how long it will take. Again, Google reiterates they are absolutely not a teleportation company and do not intend to become one. They just want to provide the back-end for an innovation that would allow people to live anywhere and commute instantly. Play Music thinks today is the perfect day to listen to some zombie apocalypse music (via Reddit). With sub-categories like Death by Metal Punk, Rock Judgement Day, and Emo Zombies, this could be the best workout playlist. If the $1000 Chromebook Pixel isn’t ostentatious enough for you, then you should try the Chrome Chromebook. This notebook is made from tungsten space-grade chrome engineering with revolutionary new microchrome technology. Additionally, the platinum white backlit keyboard LED bounces light off a minimum of seven surfaces before striking the eye. A microfiber sleeve is included in the box to insure that your Chrome Chromebook remains as shiny as the day you bought it. Head-on to the product page for a 360 degree view and click the buy link at the bottom of the page. In February, Google’s image scanning Cloud Vision entered open beta and announced official pricing. Developers can add AI smarts, like identifying emotions, detecting faces, and recognizing natural or man-made landmarks, to their own applications. With today’s Style Detection announcement, Cloud Vision can not only tell what you’re wearing, but also what it says about you. As one Googler puts it, “Imagine fashion based on data and not feelings.” It will be available starting today in alpha to a small group of developer. While Google has successfully organized the virtual realm of your sites and apps, the real world still remains chaotic. To begin tackling the physical world, Google is announcing Tag Manager for real world objects. In the coming weeks, Google will be shipping 10,000 physical tags to registered users of Tag Manager. Once a tag is placed on an object, it will show up in your dashboard. Using the power of the cloud, the contents of that item will automatically be scanned in real-time. Things that can be tagged include sharks, your lunch in the break room, and vinyls. To tackle the slips and falls of everyday life, OnePlus is announcing a new line of sandstone accessories. Taking their popular sandstone back plate, OnePlus has created an iPhone case, cups, shoes, and even soap that feature a non-slippery sandstone finish. They are available today at the OnePlus website for $9.99 each. After 30 years of development, Sony is releasing the world’s first ghost-catching device. The Proton Pack weighs 6.66 kilograms and features a state-of-the-art, miniaturized superconducting synchrotron, which accelerates injected protons from a hydrogen plasma cell. Additionally, it incorporates the same Stamina mode found on Sony’s smartphones for longer ghost capturing. Every one’s favorite Android subreddit has dropped the clean Material Design-inspired look for a more complicated and busy appearance. Much like the XDA circle jerk subreddit recreates the feel of the XDA Developers forums, the new design is quite detailed and intricate. The next major upgrade to Remix OS will take Android on the desktop backwards. In fact, all the way to the 1990s. Remix OS ’90s edition will bring the look and feel of that decade to the modern day. Users will be able to run software from yesteryear alongside today’s games and apps. Additionally, the company is running a poll to choose a Remix OS startup chime. T-Mobile’s latest un-carrier move is physical. To aid wireless subscribers in their video watching, T-Mobile is releasing a headset that dangles your phone right in front of you. As such, users will be free to use their arms and be able to look straight forward. I’m calling it. Medium is today’s victor. To compress the world’s data, X has hired Pied Piper founder Richard Hendricks as their new Chief Compression Officer. Particularly, Hendricks will work on physical compression, such as speeding up talking and listening to allow for the optimal absorption of information. By shrinking cows, a large source of carbon emissions, X will slow climate change while still allowing us to enjoy cheese, albeit much smaller cheese.